Following on the back of the huge success of the larger TriTanks, APT once again has designed a product to address the small-scale start-up market. The TT20 is a 20m^3 CIP/CIL tankage system. With advanced mixing design and higher oxygen interaction the leach residence times are greatly reduced. By analysing the leach curve of the materials, the operator can make an informed economic decision as to the required residence times of the ore. In some cases this may be as low as eight hours resulting in a 1.5tph throughput. The entire plant is modular and can be moved to a new site between three and four days. With inherent benefits such as a smaller footprint, less materials and batch carousel functionality, the TT20 is the obvious choice for start-up CIL/CIP processing. 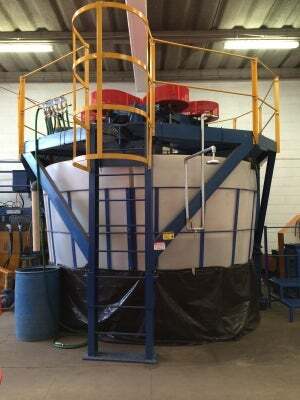 This unit is perfect for tailings retreatment of small high grade dumps, for concentrate leach, or for pilot modules. With APT’s additional processing modules , the entire processing plant can be running within days of arriving on site. For more information, please contact Appropriate Process Technologies.